Preview the Herbal Kidney Cleanse Recipe. 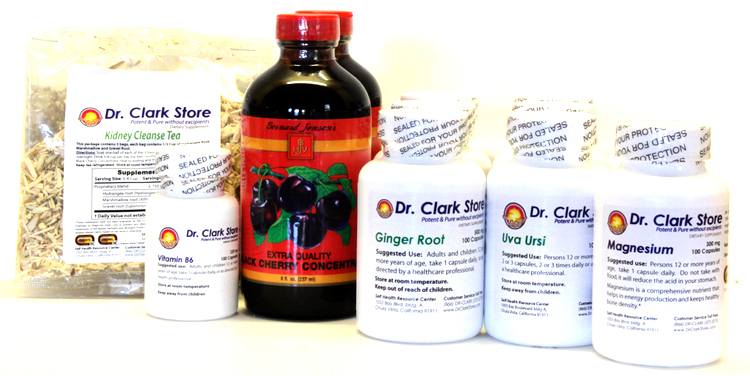 The Herbal Kidney Cleanse contains 1 set of Hydrangea / Marshmallow / Gravelroot herbs 1/2 cup each, 2 bottles of Black Cherry Concentrate 8 fluid oz, 3 bottles of Ginger Root Capsules, 3 bottles of Uva Ursi Capsules, 1 bottle of Magnesium Oxide Capsules, 1 bottle of Vitamin B6 Capsules and the Herbal Cleanses Recipe Booklet. To order contents of this package separately as individual supplements, scroll below to Related Products.